The Prototype pattern allows an object to create customized objects without knowing their exact class or the details of how to create them. It specifies the kinds of objects to create using a prototypical instance, and creates new objects by copying this prototype. The Prototype pattern works by giving prototypical objects to an object and then initiates the creation of objects. The creation-initiating object then creates objects by asking the prototypical objects to make copies of themselves. The Prototype pattern makes creating objects dynamically easier by defining classes whose objects can duplicate themselves. 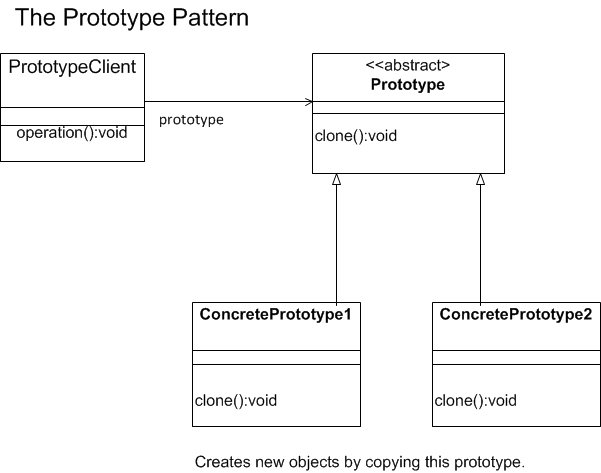 Prototype Pattern consisting of PrototypeClient and abstract Prototype class. Adding and removing products at run time. Specifying new objects by varying values. The classes to instantiate are specified at run time, for example, by dynamic loading. To implement the pattern, declare an abstract base class that specifies a pure virtual clone() method. Any class that needs a "polymorphic constructor" capability derives itself from the abstract base class, and implements the clone() operation. The client, instead of writing code that invokes the "new" operator on a hard-coded class name, calls the clone() method on the prototype, calls a factory method with a parameter designating the particular concrete derived class desired, or invokes the clone() method through some mechanism provided by another design pattern.